You've got to--belch!--roll for initiative, Morty! 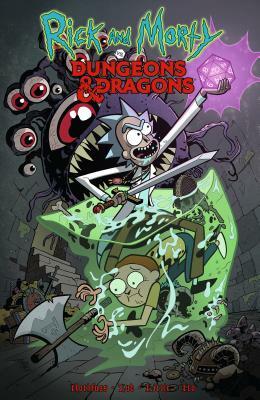 When Morty sees a cute girl at school playing Dungeons & Dragons, he asks Rick to show him the ropes, only to discover that his grandfather is a veteran gamer. Next thing he knows, the entire family has been pulled into a campaign that escalates from virtual D&D simulations to alternate universes governed by the rules of the game. And as it turns out, Rick isn't the only one who knows his way around a d20. #1 New York Times-bestselling fantasy author Patrick Rothfuss (The Name of the Wind), acclaimed comics writer Jim Zub (Dungeons & Dragons: Evil at Baldur's Gate, Skullkickers), and Eisner-nominated artist Troy Little (Hunter S. Thompson's Fear and Loathing in Las Vegas) bring you the comics crossover of the year! It's an irreverent, unexpected adventure sure to please fans of both franchises. Patrick Rothfuss is the bestselling author of The Kingkiller Chronicle. His first novel, The Name of the Wind, won the Quill Award and was a Publishers Weekly Best Book of the Year. Its sequel, The Wise Man's Fear, debuted at #1 on The New York Times bestseller chart and won the David Gemmell Legend Award. His novels have appeared on NPR's Top 100 Science Fiction/Fantasy Books list and Locus' Best 21st Century Fantasy Novels list. Pat lives in Wisconsin, where he brews mead, builds box forts with his children, and runs Worldbuilders, a book-centered charity that has raised more than six million dollars for Heifer International. Jim Zub is a writer, artist and art instructor based in Toronto. He's worked for a diverse array of publishing, movie and video game clients including Marvel, DC Comics, Hasbro, Cartoon Network, and Bandai-Namco. He juggles his time between being a freelance comic writer and Program Coordinator for Seneca College's award-winning Animation program. His current projects include Dungeons & Dragons for IDW; Thunderbolts, the return of Marvel's villainous superhero team; and Wayward, his creator-owned series about teens fighting Japanese mythological monsters. "A crossover made in heaven." -AiPT!